After our popular post on the unreliable trains, we wanted to check out the performance of the escalators. Check out the jaw dropping list of escalator/elevator outages, presumably for today. Then check out this 2006 Examiner story about how Metro opened a $1.2 million training facility to teach mechanics how to repair the system’s elevators and escalators, which you'd think would improve the performance. 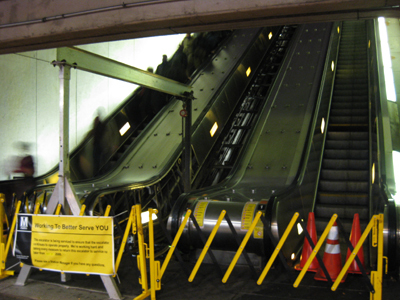 Back then, Dacid Lacosse, Metro’s director of elevators and escalators, said that "On an average day, about 30 escalators and six elevators are out of service due to rehabilitation, maintenance or repairs." There are considerably more than 30 escalators down on the list today. Metro press release on the topic. See related poll over there ---->. Incredible that an investment in improving the damn thing actually makes it worse! That is ridiculous and unacceptable, that on any given day that many escalators and elevators would be out of service. I realize these things require maintenance frequently and considering the passenger load, which will directly affect the frequency of that maintenance, that yes, they will occasionally be out of service. But for a system that claims to be so "accessible", something like this really mars that claim. I'd love to know what Metro's ROI is in general. Appears to be next to nothing.